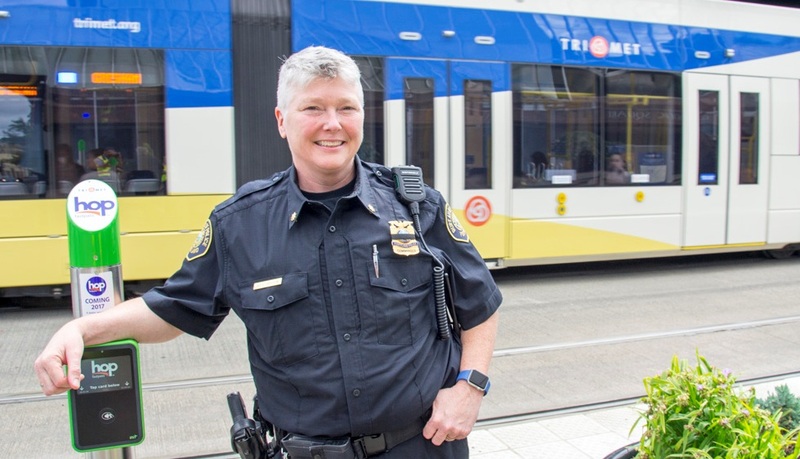 The new commander of Transit Police has had her eye on the transit unit – and TriMet – for a while, so when she got the call about her new assignment, she was thrilled. 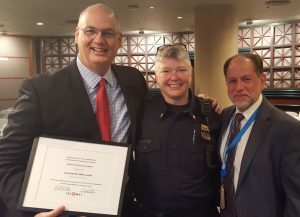 Westbrook took the driver’s seat at Transit Police on June 30 when her predecessor, Commander Mike Leloff, was promoted to Assistant Chief of the Portland Police Bureau’s Services Branch, which includes Transit Police. She has been with the Portland Police Bureau since 1993, and had served as commander of East Precinct and, most recently, Central Precinct. Westbrook has been deeply involved in the Bureau’s crisis intervention team. She’s one of the creators of the Bureau’s Behavioral Health Unit and oversaw the Canine Unit, Mounted Patrol Unit and Rapid Response Team. She’s also on the board of JOIN ─ a group helping homeless get off of the streets and into housing. Westbrook says she’s drawn toward the community policing aspect of Transit Police as well as the officers and deputies serving on the unit, which she describes as the best of the best as the assignment is a coveted one among local law enforcement. Westbrook also has messages for TriMet operators and employees, and for those who might look to harm them. “Their safety matters,” stresses Westbrook. “We have zero tolerance for assaults on operators, supervisors and field staff. Cases receive priority response and investigations, and aggressors will be held accountable.” Westbrook is serving on TriMet’s new Security Continuous Improvement Team and plans to work with TriMet employees to increase their safety. Westbrook’s roots in the Pacific Northwest run deep, growing up in Spokane, Wash. She started her police career at the Thurston County Sheriff’s Office in 1985. It was a disturbing period in Northwest history and one that drew her into law enforcement. One of the nation’s most prolific serial killers, dubbed the Green River Killer, was murdering women and girls along the I-5 corridor. Gary Ridgway was arrested in 2001, and pled guilty to 49 murders, although by his own count the number of victims is closer to 70. Westbrook spends her time away from the job with her partner of 26 years and their two dogs and a cat on their property in Clackamas County where they plan to build a house and do some landscaping. She wants to take up woodworking and metal work to build some benches and she’d love to try her hand at an excavator.